Waste clearance is one of the trickiest jobs to do. Whether around the house or your office it is a hard and tedious process that takes too much time and energy. But is there an alternative? Indeed there is. Our specialized company offers its services for junk removals in the City of London. But what makes us the right choice? It is true that there are a large number of removal companies on the market today (as a matter of fact – too much) but unfortunately instead of increasing quality the fierce competition has only lead to decrease in prices. Still, less expensive is good right? No, not when service quality is being sacrificed. Currently we’re the only company that does removals in London City with a great price to service quality ratio. We’re not the type of people who cut corners or do their job sloppy. We have the skills and capacity to handle any rubbish removal regardless the volume of the waste or the type of material. This excludes hazardous and toxic materials which have difference and specially regulated procedures of disposal. Please not that while the price is generally calculated by volume in certain extreme cases it might be calculated according to the weight. Speaking about the price, one of the things that truly separate us from our competitors is our pricing policy. While the reference prices put on our website look quite appealing themselves things only look better once you consider we offer custom pricing for each junk removal in London City. If you’re interested in hiring a rubbish removal team but would like to find out the final value in advance we can provide you with a free of charge quote based on the waste clearance job details you’ve provided. Not only is the price custom but we will also organize the entire removal according to your requirements. We understand how busy today’s life is so not only we do the clearance in a convenient for the customer time but we can actually handle a junk removal in the City of London even on weekends and official holidays. Don’t fall for other offers for junk removal in London City. We are the company to call for such needs as we have a wide array of cleaning and waste collection services in EC1 and EC3. Our advanced supplies allow us to perform garbage removals quickly and effectively. Along with that we have low prices and our services are extremely affordable. Availability is also important and you can get in touch even during weekends and holidays. Call our numbers today. Although the City of London is perhaps the oldest and “original” part of London, when people use the name London today, they tend to refer to the entire Greater London area. It has its roots in the age of Roman occupation. The modern city is one of the most important places in the world. While there is a very low number of permanent resident here – just seven thousand, a staggering 300 thousand people come into the ceremonial county each day to work. London City is not just one of the most important global business centres but it is universally recognised as the global financial capitol, surpassing New Yourk and Hong Kong in importance for the banking, insurance and trade sectors. The City of London is a city and county but yet a tiny part of the metropolis of London. Although the City doesn’t form a Borough it is very essential part of central London. The British capital is home to a great number of landmarks which allure thousands of visitors every day. Some of these places of interest include the Monument to the Great Fire of London, St Paul’s Cathedral and the Temple area. Our junk removal services in the City of London, EC1, are adequately covered. We have insured our garbage collection options because we are reliable contractors but more importantly, because we want our clients to have the peace of mind that they have delegate their domestic and commercial waste clearances to attentive professionals. The fact that we are insured does not mean that we do not work with the outmost care and attention to details. After all, we do have a 0% accident ratio. The City of London, EC3, is home to some of the tallest edifices not only in the United Kingdom but also in the world as a whole. Leadenhall Building is the highest structure in the area. It was completed in 2014, comprised of 48 floors and has a height of 738 feet. British architectural firm, Rogers Stirk Harbour + Partners, designed it. 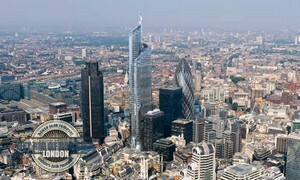 Other notable edifices in the City of London are, Heron Tower, Tower 42, The Gherkin, Broadgate Tower and more.